With his attacks on Kerry, Israeli Defense Minister Moshe Ya’alon is positioning himself as the new leader of the Israeli right. I basically agree with those claiming that there is no daylight between Prime Minister Benjamin Netanyahu and Defense Minister Moshe Ya’alon on the issues, only on style and timing. Netanyahu has surrounded himself with opponents of the two-state solution: his political circles are full of settlers, national-religious and other hawks — and not only in the cabinet, but in his own bureau. As veteran political correspondent Shalom Yerushalmi noted in Maariv on Wednesday, for weeks these people have been running around saying what Ya’alon said to anyone who would listen, only they were saying it in private. People like Israel’s ambassador to the U.S. Ron Dermer and Netanyahu’s new policy adviser Dore Gold have spent their entire professional careers arguing against a Palestinian state based on 1967 borders, land swaps or not, and none of their recent statements show any change of heart – neither has Netanyahu, for that matter. The nearly nine-year guessing game about Netanyahu’s “true” intentions says more about those doing the guessing than the man himself. Just like Netanyahu, Ya’alon probably understands that the negotiations serve Israel’s interest by maintaining the status quo, since most of the international pressure on Israel tends to go away when peace talks are taking place. That is why even Naftali Bennett supports the talks, or at least doesn’t mind them. So what made Ya’alon pounce, attacking Secretary Kerry so viciously in a conversation he surly knew would leak? Part of the answer is a matter of personality. Ya’alon is a real ideologue and he has a history of not hiding his views. Ya’alon was a popular chief of staff under Sharon, but his opposition to the Gaza disengagement cost him his job (he is one of few heads of the IDF who did not have his term extended to a fourth and final year). Later, when Hamas took over in Gaza, Ya’alon scored many points with the Israeli center, on top of the admiration he already had from the settlers for supporting their cause. After the last elections, those very same groups were the ones petitioning Netanyahu to make Ya’alon his new defense minister; to be sure, Bibi knew what he was getting. But there is also a political angle here. Every round of talks and every prospect of withdrawal presents a huge opportunity for the politician who could foreseeable lead opposition to that very deal/withdrawal/agreement. Again, Netanyahu should know. That is how he made his own career, by opposing Oslo, Camp David, the Taba talks, the disengagement and Olmert’s Annapolis process. As leader of the rejectionist right, Netanyahu was able to build the political base that serves him to this day. Even now, the mainstream of the settler movement and the far-right are not willing to part ways with Netanyahu. In case something does come of the current peace process, and that something could be as small as an Israeli agreement to continue negotiating after Secretary Kerry presents his non-binding framework, someone will emerge to lead those who oppose it from the right. It will be someone who can carry a huge Knesset bloc – most of the Likud, the entire Jewish Home party, some ultra-Orthodox and maybe even one or two from Yair Lapid’s Yesh Atid party, which isn’t as ideologically coherent as some people like to think. And if nothing happens, then Ya’alon emerges as the winner anyway, having predicting the talks’ failure. MK Miri Regev, one of the more vocal backbenchers in the Likud and the head of the Knesset’s important Internal Affairs Committee already posted a Facebook status congratulating Ya’alon for his statements against the secretary of state and the impending “buy-off agreement” (the Hebrew wording means something closer to “surrender agreement”) he is trying to promote. 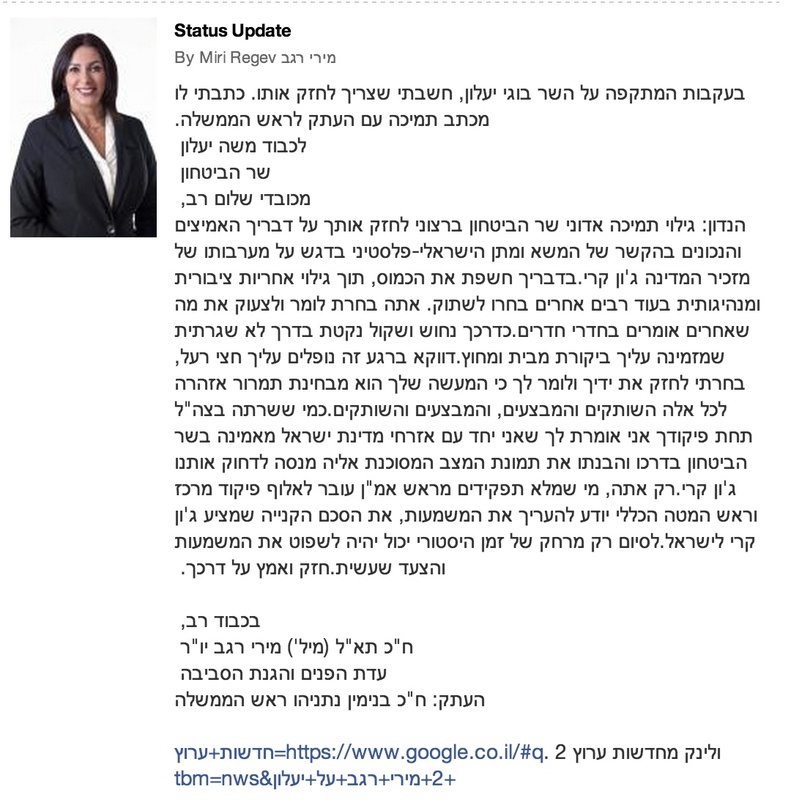 Regev later removed her post; a screenshot can be found on Tal Schneider’s political blog. Ultimately, the elephant in the room is not Regev, other backbenchers, Bennett and the settlers or even Ya’alon. The problem is Netanyahu and the way the Obama administration is allowing him to avoid any real commitment to the peace process. Netanyahu is negotiating without accepting the terms of reference that were agreed upon in previous rounds of talks; he continues to populate the West Bank with Jews; he is constantly adding new hurdles and conditions; and he is moving the Jewish-Israeli public further and further to the right with his statements and actions. That is how Netanyahu can continue to talk to the Palestinians while maintaining his coalition with the likes of Bennett and Ya’alon. Real commitment comes in the form of political capital, not the political theater surrounding meaningless gestures like the prisoner release or “a partial settlement freeze.” Sharon sacked Likud ministers who opposed the disengagement and broke away with his own party. Without a duel political crisis – one between Washington and Jerusalem and another inside the Israeli government – the entire Kerry process remains a theoretical exercise, empty words and not much more. It’s because he’s not very smart. Ideologically, there isn’t really a big difference between Ya’alon, Barak, Netanyahu or even Livni – all of them hate the idea of making peace with Arabs, but love the idea of fooling the world into thinking that they care about peace. Ya’alon’s problem – unlike, for example, Barak – is that his I.Q. is pretty low. Other than that, there is no daylight between him and the rest of them. I just realized something: Look at the picture above. Look at those faces. It is a picture of two grown men who answer to the name, respectively, of BOGIE and BIBI. If that little tidbit of information doesn’t tell you nearly everything you need to know about Israel’s current leadership, I don’t know what will. Show me another country whose top leadership sounds like a couple of characters out of Looney Toons. Ya’alon’ comments were neither vicious not public not unusual in public life. What is unusual is the prime Ministers behavior extreme actions on the right followed by extreme capitualation… build… capipitualte from a military plan to take back the philadelphi corridor, kvetch to the Un about red lines, and fail to demand that parties to signtories fulfil their committments… sign an agreement with Hamas that Hamas does not agree to…say nothing, demand nothing when it is broken..
allow Obama to blame Israel and ONLY Israel for lobbying. Netanyahu’s goals are not different that Ya’alon’s. Netanyahu tactics are counterproductive. Three ministers have now used the media to derail the talks: defense, housing, and foreign affairs (Lieberman, reviving the corporate stripping of Israeli Arab citizenship to transfer villages to a new State, could never be affirmed by the PA, as it is a loss of personal autonomy of those where they and their parents were born). Given the overriding importance of peace talks in which one’s premier international backer/protector is involved, one of these statements, let alone three, without disciplining, indicates there is no ruling government at all. You have a War Council where primary members must be given their spoils; these spoils include settlement expansion, control of Arab Israeli citizens, and State purity relating to refugees. In all three the rule of law is contorted to Council needs. The only obvious counter instance I see is in the proposed expansion of military service among Jews, removing the exemptions, which does move to universalize law. While this expands the Jewish citizen ethos of the military, no attempt will be made to expand such to all citizens, so conforms to the insularity of the other three cases. Each minister has publicly insulted the PM. The US as for silence over the negotiations, and the Israeli side has honored that. So Bibi’s purported coalition supporters attack in other way, offering themselves as replacements. Such a War Council will tack to extreme positions, for all within must be satisfied. I now see why many admire Sharon’s politics. This article, is yet again one-sided and false. Ya’alon’s comment is offensive and uncalled for. Yet, the peace negotiations have mostly been rejected by Palestinians, to the point that a right wing coalition, and now you call this right wing government a peace rejectionist. Well, on the contrary – but, Palestinians show their real intent – never sign a complete peace agreement with Israel, no matter who’s the leader, and what the terms are. The Palestinian terms for peace are well known; A sovereign state within the -67 borders and a just solution to the Refugee problem … Tell Benjamin to come sign now? I think the problem is the Israeli electoral silence. Where is the liberal-left political effort? How are hearts and minds going to change, waiting for the US to press Netanyahu? Do you know how silly that sounds? A great question Richard… the answer is in the brain-drain. After the “social justice” movement was co-opted and the “leaders” of that movement jumped into the Knesset, morale was shattered. There is no organized left-wing in Israel, and the NGOs and civil society groups are utterly delegitimized. If it wasn’t for the EU and the USA even these small vestiges of political plurality would simply be abolished by fiat. American Jewish millionaire and founder of intelligence group, ‘Stratfor‘, George Friedman in his book, ‘The Next Decade’, has asserted that Obama administration must distance itself from the Zionist regime over its Middle East policy. The featlt over-estimated money the US “gives” to Israel, less than 1% of Israel’s budget is almost exclusively earmarked for purchase of outdated US equipment, or development of military equipment. Israel improves outdated equipment which it modifies, innovates and provides the US with specs and the results of battlefield. US defense contractors use these results to build, use and sell equipment. That’s not all. In exchange, the US gains the privilege of negotiating “peace”, telling Israel to limit military actions leaving the country open to attack, limiting Israel’s marketplace (no sales to China allowed), the right to meddle in Israel’s internal politics and the right to tell Israel and American lobbies they are out of line. If you disagree, state your point rather than saying it must be true since a Jewish person, a millionaire no less, says so.